God Gave Us Wings by Connie Rankin Racked Up a Gold and Silver Award for Going the Extra Mile to Produce a Book of Excellence. 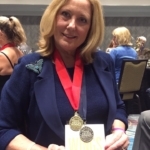 HOUSTON, TEXAS — The Annual 2017 Florida Authors and Publishers Association President’s Book Awards recognized God Gave Us Wings by Connie Rankin, in two categories including Religion as Gold, and Biography as a silver medal winner. God Gave Us Wings is a non-fiction, published by Morgan James Faith, Connie, the author provides you with inspirational stories of success from different life experiences to help you see that at any moment, through faith you can ultimately change your life; if you believe, you can finish strong. As these stories testify, you can fly higher than you ever imagined, if you believe. “We are proud to announce this year’s winners who truly embody the excellence this award was created to celebrate. We had a record number of entries this year. The competition was stiff! We salute all of our winners for their fine work,” said FAPA’s President, Terri Gerrell.